2014 incoming East-West Center students. Photo courtesy of East-West Center. 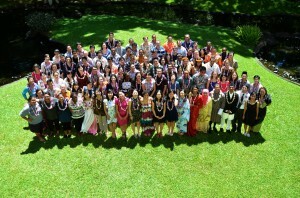 For the first time in the East-West Center’s history, students from Oceania comprise the largest percentage of incoming EWC student participants, thanks to the establishment of the Center’s Pacific Islands Leadership Program and several other new programs geared toward Pacific islanders. Students also hail from the U.S., most countries in Asia, and as far away as Italy and Zambia. During special orientation and community-building activities prior to the start of the fall semester, the Center welcomed 128 new student fellows from more than 41 countries and territories. 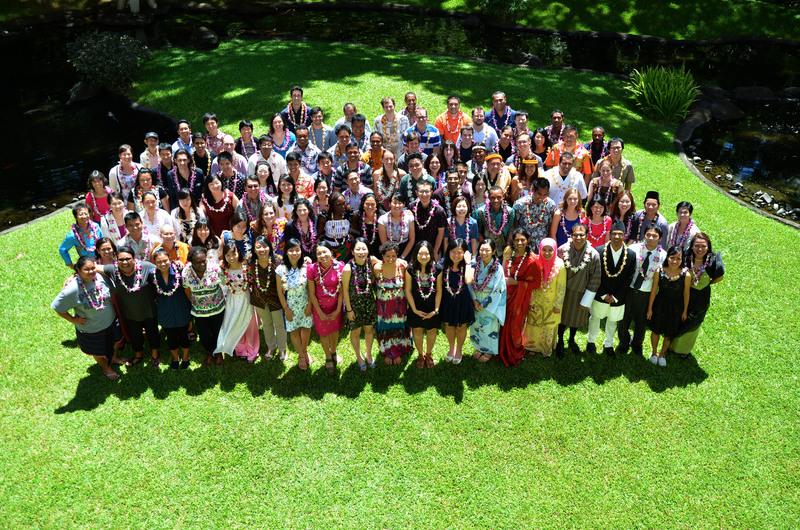 The majority of the new students are pursuing graduate degree programs through the University of Hawai‘i, while about 50 of the arrivals are participants in EWC’s expanding roster of leadership certificate programs. Before beginning their regular studies, all new East-West Center students participate in a two-week Community Building Institute, featuring a wide variety of workshops, field trips and activities to develop collaborative team-building, cooperative study, cross-cultural understanding, regional literacy, leadership and service.